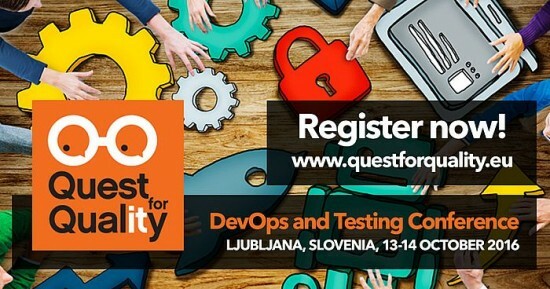 We are pleased to announce that the 1st DevOps and Testing conference will be held from 13-14 October 2016 at Cankarjev dom in Ljubljana, Slovenia. The 2-day testing community event is expected to attract 200+ test engineers, test leads, test leaders, quality directors and other key industry professionals from the Adriatic region, DUCH countries, Ireland and UK. It will represent a unique opportunity for individuals working in software testing, software security and software quality to exchange opinions, showcase their projects and stay up-to-date on the latest industry developments. The DevOps and Testing conference will cover a wide scope of topics, including Agile methods in Testing, DevOps, Automated Testing, Quality Assurance and Security. A diverse line-up of keynote speakers will be taking the stage to share their industry knowledge, discuss the latest innovations and trends and guide the testing community forward. said Joan Wrabetz, CTO of Quali, who will be joining the lineup. Other confirmed speakers include Colin O’Brien, Head of QA & Change Control at Ryanair Labs, Finn Lorbeer, Quality Acrobat at Thoughtworks and Milan Gabor, Founder and CEO of Viris. said Nikola Šopar, Director of Quality at Comtrade. The conference will host a roundtable titled ‘How to ensure good quality in projects of Digital transformation’, providing senior tech executives with a chance to meet face-to-face and discuss current topics, challenges, strategies and opportunities. Set to bring the testing community together, it will also offer an opportunity to chat with fellow delegates at the networking event at Club CD.